^ a b c d e f g h Ambrose, Joe (2003年1月13日). 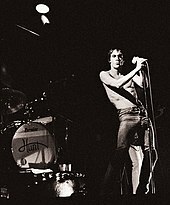 Gimme Danger: The Story of Iggy Pop. Omnibus Press. ISBN 978-0-7119-9107-1. ^ a b c d e f g h i j k l m n o p q r Trynka, Paul (2007年). Iggy Pop: Open Up and Bleed. Broadway Books. ISBN 978-0-7679-2722-2. ^ Fricke, David (2007年8月). イギー・ポップ インタビュー. ローリングストーンジャパン. ^ a b c d e f g h Gold, Jeff (2016年12月5日). TOTAL CHAOS: The Story of The Stooges / As Told By Iggy Pop. Third Man Books. ISBN 978-0-9913361-9-7. ^ Bangs, Lester (1987年). Psychotic Reactions and Carburetor Dung. Anchor Press. ISBN 978-0-6797-2045-4. ^ a b Ungemuth, Nicolas (2002年10月15日). Iggy Pop. Librio Musique. ISBN 978-2-2903-2058-7. ^ Tony Horkins (December 1991). “TIN MACHINE: BOWIE & GABRELS”. International Musician. http://www.bowiewonderworld.com/press/press90.htm#IM 2012年2月9日閲覧。. ^ Buckley, David (2015年5月1日). David Bowie: The Music and the Changes. Omnibus Pr & Schirmer Trade Books. ISBN 978-1-7803-8988-2. ^ rockin’on　1989年4月号 来日インタビュー. 株式会社ロッキング・オン. (1989年4月). ^ Per Nilsen; Dorothy Sherman (1988/12/31). The Wild One: the True Story of Iggy Pop. Omnibus Press.